​ Double click in the box for a description of each assessment. This technique provides students with a structured way to reflect on their learning. Students typically respond in writing to three reflective prompts describing what they learned from a lesson or activity. This allows students to share what they understand and identify areas that are still challenging for them. A teacher can also analyze these responses to learn to what extent learning goals were met. 3 things I learned from the lesson/ unit…. This exercise is an opportunity for students to think about their own understanding and consider how to explore or design an investigation. Students are asked to analyze a set of fact/fiction statements. First the students choose to agree or disagree or if they need more information. Then they are asked to describe their thinking about why they agree or disagree or are unsure. And finally they describe what they can do to investigate the statement by testing their ideas, researching what is already known, or using other means of inquiry. To develop statements, the teacher needs to consider and include specific concepts and/skills that they will encounter in the unit or lessons. When the teacher develops the “statements” s/he needs to keep in mind that they should lead to activities that students will do in the lessons, such as hands-on activities, books, videos, or other information sources. This exercise can encourage discussion and scientific argumentation. To review this strategy further see Keeley, 2008. Student Directions: Check whether you agree with each statement and your thoughts about what you know about the statement. In the other column, write how you could find out whether or not the statement is true. Application problems allow teachers to have students use analytic reasoning to make connections between a new phenomenon and a concept they learned. The students use concepts learned to explain their solutions or explanations. For example, students may have just completed a lesson on pendulums. An application question might be “How many methods can you develop to fix the crooked swing in my back yard?” For additional details and examples see Abell and Volkmann (2006). This technique is similar to a web in that it is a visual display of concepts; however, students also demonstrate the relationships between concepts and the display demonstrates a hierarchical understanding of concepts. The broad or most inclusive concept is at the top and the more specific concepts are at the bottom of the concept map. At the beginning of the lesson or unit, the teacher provides students with a concept and a list of additional facts/terms/vocabulary that students will organize and link together visually showing how students understand relationships to the overarching concept. The concepts are enclosed in circles or boxes and relationships between concepts indicated by a connecting line linking two concepts. Words on the line, referred to as linking words or linking phrases, specify the relationship between the two concepts. This visual display shows the student and teacher how a student understands the relationship between different concepts. For more details and an example of a concept map go to this EXAMPLE. This exercise provides students with a data set from a familiar investigation and several statements about the data. Students are asked to use evidence from the data to determine which statements (below the data table) are accurate. The teacher can take class results in a graph or data table and provide various statements, some claims and some inferences to determine how students analyze data. This helps teachers determine whether students rely on evidence derived from data collection in an investigation or whether they make inferences and form interpretations based on their own beliefs. The teacher could do this exercise before students analyze their own data. 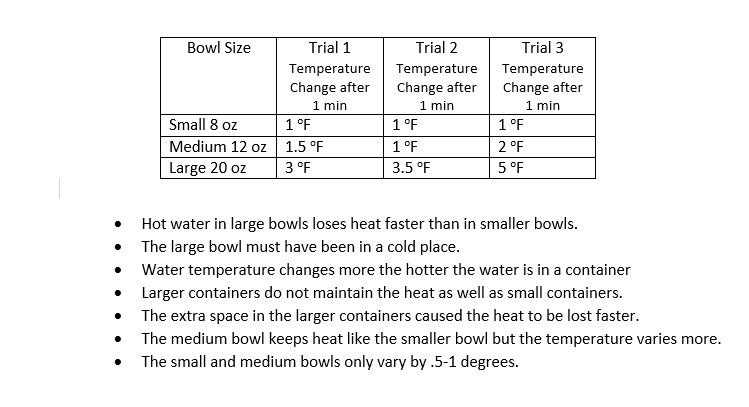 The teacher could review students’ initial ideas or predictions about the experiment and use those as part of the choices below. This provides students with an opportunity to identify evidence, practice interpreting data, and consider how confident they are in interpreting results from an experiment. For additional details see Keeley, 2008. Student Directions: The data table below shows the results of our porridge experiment. Review the data table below. Read through the statements below. Identify the best statements that accurately summarize the data. A demo memo is used after students observe and discuss a demonstration. This experience encourages students to make observations and use evidence to make a claim. At the end of a lesson, students write a brief summary of the features of the demonstration (making observations) and describe what happened (evidence) and how it provides an example of a scientific principle (making a claim and reasoning). This exercise helps students develop explanations and construct arguments while informing the teacher about how students are constructing their ideas using the evidence. For more details and examples see Abell and Volkmann, 2006. After exploring how mirrors can be used to reflect light from one place to the wall, students might be asked: “How did you position the mirrors to reflect light onto the wall? Using your experience aiming the light, how do you think the story of Archimedes's could be true? Draw a diagram and explain how it could work. I can claim that the air slows down the parachute. it fell slowly compared to dropping the ball without a parachute. inside and all the air inside slowed down the ball. ​ This happens because air resistance slows the parachute. Design activities encourage students to apply science to engineering. After introducing a science concept, teachers could ask students to use their new science knowledge to propose a design or build an engineering challenge. Students work in groups or individually to design something that addresses the challenge. For additional details and examples see Abell and Volkmann, 2006. Design a roller coaster ride and describe how it would be constructed for maximum thrill. Criteria for students might be to draw, label and explain potential energy, kinetic energy, the first law of thermodynamics, friction, speed, and acceleration. ​The exit ticket provides teachers and students with feedback about what is clear and unclear to both the student and teachers. It is typically done at the end of a lesson so that teachers can review student responses. This could be administered at any time during the 5E learning cycle; it could be done to elicit students’ initial ideas about a concept, provide feedback about understanding from a lesson, or show how students can apply and transfer their understanding. During the ‘Explain Phase,’ the teacher might ask a few questions at the end of the class. ​Reflecting is an opportunity for students to summarize current understanding of the topic or concept using diagrams, verbal explanations, and/or data from classroom discussion. Teachers should encourage students to use evidence from their exploration and explanations to develop the reflection. Similar to the earlier example about the water cycle drawing, a final reflection could be for students to draw and label a figure that would help a classmate understand how water cycles on earth. What do I think I know? What I wonder about? What I learned? 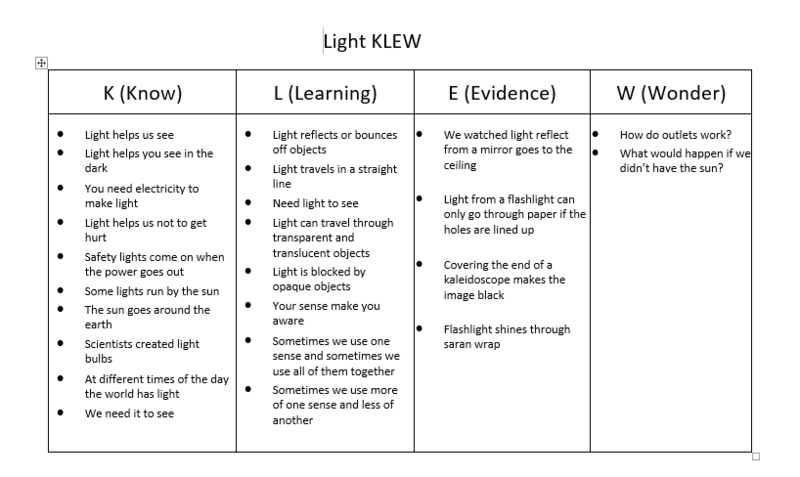 The K and W are done prior to learning or investigating and the L is done at the end of the learning/investigation. When teachers ask children “What do you know,” in science, it is also important to ask “how” children know? This helps elicit student conceptions and helps students develop a deeper understanding about evidence and using evidence in an explanation. Did they observe it or read about it or did someone tell them about it. The “how” of this exercise offers the teacher an opportunity to gain more insight into student understandings but also to teach students about different methods of understanding. KLEW What do I think I already know? What I am learning? What is evidence for what I am learning? What do I wonder about? KLEW – What do we know about the topic? What are we learning? What evidence supports what we are learning? What new wonderings can we investigate? The K is used to guide instruction as the teacher begins a lesson or investigation. The L occurs following the exploration/investigation; these are the knowledge claims that students can make about a topic. In addition, the E occurs when students are asked to support how they know what they learned by describing the data or results. This column of the chart must support the L column. During the investigation students always come up with new questions, which can be recorded in the W portion of the chart. These may come during and after the investigation. (Hershberger, Zembal-Saul, & Starr., 2006). ​A 3-D model is used by scientists to help visualize and explain aspects of the natural world that are impossible to see or experience. A teacher could assign a model in small groups, have students discuss and explain how it could be used to support evidence from the ‘explore’ phase. Teachers may quiz the students on aspects and components of the model or students may write about the parts and how they function. This is also one of the SEPs and asking students to explain the concept of models can also be a focus of this assessment, for example having students describe how the model is similar and/or different to what it represents and how it could be improved. For additional examples see Abell and Volkmann, 2006. A meaningful paragraph provides teachers with feedback about student learning following a lesson. The teacher asks a question or makes a statement and students write a paragraph that includes terms,concepts, or explanations from the topic of study. However, it could be used to elicit student preconceptions and to check for transfer of learning, depending on when and what types of questions are asked of the students. The example below could be a meaningful paragraph or it could be a quick write in a science notebook. For additional examples, see Abell and Volkmann, 2006. For example How did air affect the parachute? ​This strategy can be used at the beginning of a lesson or unit to engage students and used by presenting students with statement about an experiment, a question about a phenomenon, a problem, a demonstration, or a probe. The strategy involves asking students to predict what they think the class should do and why (explanation) or what they think will happen and why (explanation). In the probe below, there are a series of statements that students could choose for their prediction about what they think is the best idea. However, when given a problem or phenomena, students could be asked to think about what they already know about a topic, designing experiments, etc… and their prediction could be based on their own ideas. After students make their predictions, the teacher will have students explore or experience a demonstration and students will make observations about what is happening. This initial assessment can be extended so that after this experience students can use their observations as evidence to explain what happened, which could be combined with meaningful paragraph and other FA strategies in the ‘Explain Phase’ section. For more information about formative assessment probes, go to Formative Assessment Probe. This is an introduction from Keeley, Eberle, Farrin (2005). These exercises promote students to ask their own questions. The extent to which students can formulate effective questions about a topic can indicate how well students understand ideas that underlie the topic. Students need an opportunity to explore and develop curiosity which will lead to students’ asking their own questions. The teacher can give students a problem, statement, picture, or object to explore. Encourage students to make observations (qualitative and quantitative) and record questions they have as they explore. Two columns on a notebook page one side for observations and the other for writing questions. Another way of having students generate questions is having a Question board/parking lot in the room for students to post their questions. Using sentence stems, such as encouraging them to write or respond to “I wonder…” stems can help students think about questions. What could be the reason for….? How could we find out if….? For additional examples of questions, see the “ Guiding Questions to Support Scientific Thinking” handout. 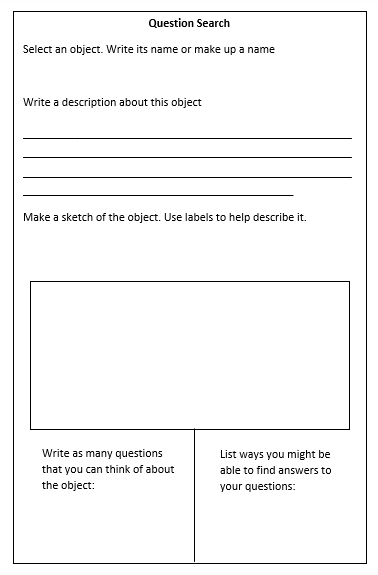 ​Below is another type of more structured prompt that can help pairs or groups organize their observations and develop questions. This also helps teachers and students become more aware about scientific questions vs. non-scientific questions. Source of figure below: Pearce, C.R. (1999). Nurturing Inquiry. Portsmouth, NH: Heinemann. Science notebooks are used by scientists for recording a scientist’s research which include data, notes, and thoughts. Teachers can have students use science notebooks in the same way, as a tool for students to record data and thinking as they work with science materials - planning for an investigation, recording words, pictures, photos, designing models, analyzing and interpreting data, asking questions and making predictions, constructing explanations, engaging in argument from evidence, and obtaining and communicating information. It can become a portfolio of student learning and conceptual understanding over time; each phase of the 5 E learning cycle can be documented in the notebook. This becomes a tool for formative assessment as well; all the formative assessment strategies described in this handout can be incorporated into a science notebook. The notebook can be reviewed by the teacher on a regular basis. For a brief overview of organizing a notebook and sources about science notebooks. 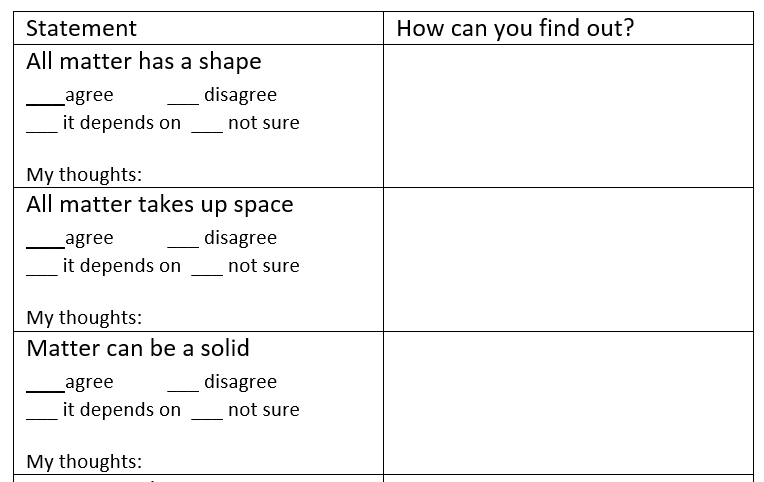 ​This exercise helps students reflect on their work and depth of understanding, focusing them on comparing their initial ideas with incoming ideas. The teacher might provide sentence stems or questions and teachers might respond to these to help students develop a deeper understanding of learning goals. A teacher could combine this exercise with other formative assessment strategies from the ‘engage’ phase. For example, KLEW, concept maps, annotated drawings, etc... The teacher could require students to include the example of their initial ideas and current thinking as part of this exercise, which could be done as a paper or interview with a student. Before I thought…. And now I think…. The teacher can use SEP analysis to encourage self and peer assessment as students become more aware about SEPs. Below is an example of constructing explanations. Students can do this themselves or with a partner to critique any skills or content, including the SEPs. This would be done at the end of an assignment before students complete their final work. The teacher should model how to use this assessment with students. The teacher could collect and respond to student comments as well. A useful resource for the teacher to reflect on SEP goals and development is the NSTA/NGSS SEP Matrix (NSTA, 2013). For each grade level span, the key skills and elements associated with each SEP are listed. A teacher can identify the element(s) associated with a particular lesson and develop an analysis checklist or series of questions. If used with a partner, the teacher could require students to write comments or serve as a checklist and discussion between pairs. Teachers can also consider taking the assessment criteria they use or statements and turn them into “I can do” statements. My explanation is based on an investigation or activity from class. This cooperative learning exercise gives the teacher a quick check of concepts students learn from a lesson. The teacher might pose a challenging question and give student pairs a short time to think and reflect about the question individually. Then they can discuss their thoughts in pairs. Finally students share their answers with the class. ​Teachers can ask students to write their own fictional story that incorporates science concepts in a creative way. Teachers would need to develop criteria and concepts to be addressed in the project. For additional examples see Abell and Volkmann, 2006. Describe a day in the life of a Martian organism. Describe the journey of a drop of water traveling the water cycle. Abell, S. A and Volkmann, M.J. (2006). Seamless assessment in science: A guide for elementary and middle school teachers. Heinemann: Portsmouth, NH. Jackson, J., Durham, A., Dowell, S., Sockel, J., and Boynton, I. (2016). Claims and evidence: Creating opportunities for students to practice speaking and writing about science. Science and Children. 54(4): 64-69. Keeley, P. (2008). Science formative assessment: 75 practical strategies for linking assessment, instruction, and learning. Corwin Press: CA. National Research Council (NRC). 1996. National Science Education Standards. Washington, DC: The National Academies Press. https://doi.org/10.17226/4962. ​ Sharkawy, A. (2010). A quest to improve: Helping students learn how to pose investigable questions. Science and Children. 32-35.